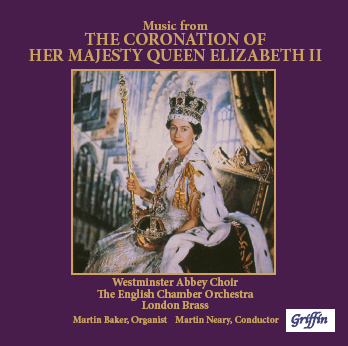 Fanfares and anthems commissioned by previous Monarchs, together with classic hymn settings and marches, all combine to recall the actual service and musical spectacle of the Coronation. For full information, please click here. Music from the Coronation of Her Majesty Queen Elizabeth II. Westminster Abbey Choir, The English Chamber Orchestra, London Brass, Martin Baker (Organist), Martin Neary (Conductor). Trumpet Tune Purcell Westminster Abbey Choir, The English Chamber Orchestra, London Brass, Martin Baker (Organist), Martin Neary (Conductor). I Was Glad Parry Westminster Abbey Choir, The English Chamber Orchestra, London Brass, Martin Baker (Organist), Martin Neary (Conductor). Behold, O God Our Defender Howells Westminster Abbey Choir, The English Chamber Orchestra, London Brass, Martin Baker (Organist), Martin Neary (Conductor). Let My Prayer Come Up Harris Westminster Abbey Choir, The English Chamber Orchestra, London Brass, Martin Baker (Organist), Martin Neary (Conductor). Zadok The Priest Handel Westminster Abbey Choir, The English Chamber Orchestra, London Brass, Martin Baker (Organist), Martin Neary (Conductor). Be Strong and of Good Courage Dyson Westminster Abbey Choir, The English Chamber Orchestra, London Brass, Martin Baker (Organist), Martin Neary (Conductor). Rejoice in the Lord Always Anon Westminster Abbey Choir, The English Chamber Orchestra, London Brass, Martin Baker (Organist), Martin Neary (Conductor). Thou Wilt Keep Him In Perfect Peace S.S. Wesley Westminster Abbey Choir, The English Chamber Orchestra, London Brass, Martin Baker (Organist), Martin Neary (Conductor). All People That On Earth Do Dwell Westminster Abbey Choir, The English Chamber Orchestra, London Brass, Martin Baker (Organist), Martin Neary (Conductor). Sanctus (Communion Service in G Minor) Vaughan Williams Westminster Abbey Choir, The English Chamber Orchestra, London Brass, Martin Baker (Organist), Martin Neary (Conductor). O Taste and See Vaughan Williams Westminster Abbey Choir, The English Chamber Orchestra, London Brass, Martin Baker (Organist), Martin Neary (Conductor). Gloria in Excelsis Stanford Westminster Abbey Choir, The English Chamber Orchestra, London Brass, Martin Baker (Organist), Martin Neary (Conductor). Te Deum Laudamus Walton Westminster Abbey Choir, The English Chamber Orchestra, London Brass, Martin Baker (Organist), Martin Neary (Conductor). Fanfare and National Anthem Westminster Abbey Choir, The English Chamber Orchestra, London Brass, Martin Baker (Organist), Martin Neary (Conductor). March: ORB and Sceptre Walton Westminster Abbey Choir, The English Chamber Orchestra, London Brass, Martin Baker (Organist), Martin Neary (Conductor). March: Crown Imperial Walton Westminster Abbey Choir, The English Chamber Orchestra, London Brass, Martin Baker (Organist), Martin Neary (Conductor).